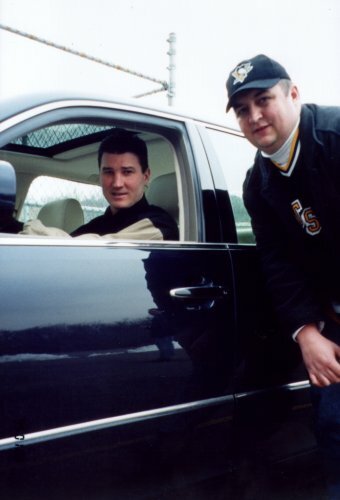 The cab drive to the Iceoplex at Southpointe to watch the Penguins practice on one of their non-game days was always intended to be part of the week’s activities in Pittsburgh. It was an opportunity to watch a team practice (something we don’t get much chance to do over here in the UK) and we had been told it was the ideal chance to get a few autographs. And so, it was with this in mind that we set off from our base at Days Inn (via the Eat N’ Park for breakfast) to Southpointe. As usual, we struck lucky with the cab driver, this one was a 20 game plan holder and was more than a little surprised at two people coming all the way from the UK to watch a few Pens games!! After a pleasant 20-25 minute drive and chat with the driver about how the Pens were doing, do they have hockey in England etc etc we arrived at the Iceoplex. On entering we were immediately drawn to the photos above the entrance to the rink showing the Stanley Cup winning squads - one of which included Frank Pietrangelo who recently played for Manchester Storm over here in England. Then I was off into the rink to take a couple of snaps before the practice started. With the piccies out of the way we hit the team shop!! Through all this (and ever since we booked the trip) going through my mind was ‘will I get to meet him?’ - I had brought an 8x10 picture all the way from England with me to get him to sign it if I did. As we took our seats (damn, it was freezing in there!!) 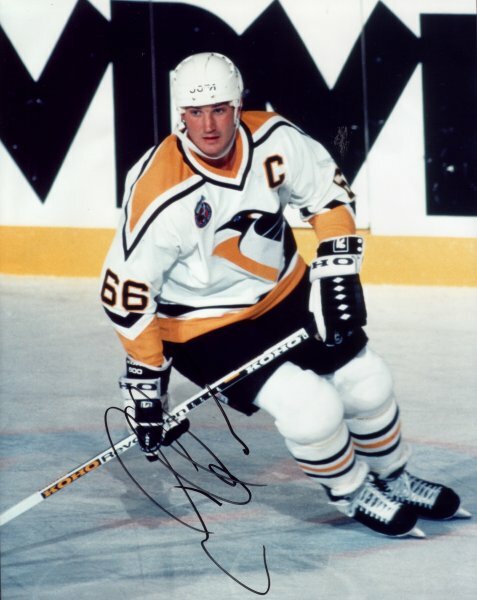 we caught a fleeting glimpse of #66 and his back therapist moving around behind the scenes and when the Pens finally took to the ice Mario didn’t join them - choosing instead to rest his troubled back. 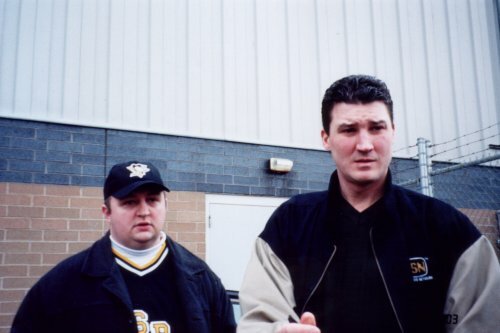 Watching the practice was great and the personalities on the team seemed to come across more in the smaller arena with Darius Kasparaitis appearing to be the joker of the team and superstar Jaromir Jagr only joining in the drills when he fancied it!!! And then 45-50 minutes later it was all over, the practice was scheduled for two hours but within one the ice was deserted. The 20 or so people that had turned up to watch the practice trailed outside and down the car park to the back door of the complex where one or two of the players cars could be spotted from our session outside the arena the night before (see The Pens for more). And then, the waiting began! In an effort to avoid any disappointment on my part my wife kept telling me that Mario had probably already left not having practiced and all but we waited and got a few more autographs of players on the way out including Lang, Aubin, Kaspar, Parent and others - nearly got knocked over by Straka in his BMW though!!! 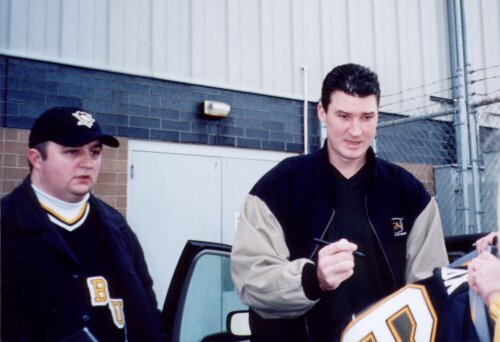 Our patience was eventually rewarded when Jaromir Jagr emerged and signed a few autographs (he is, apparently, usually unwilling to do a lot of this type of thing!). But still, no Mario!!! About 10-15 minutes later he appeared and everyone who was there surged towards him. At first I thought he was just going to get in his car and drive off as he seemed to ignore everyone and keep walking. When he did get to the car, he dropped his stuff on the seat and turned to the assembled throng proclaiming that he would sign one thing per person! I got my photo signed (see right) but that was only half the plan accomplished - I was hoping to get a picture with him..... 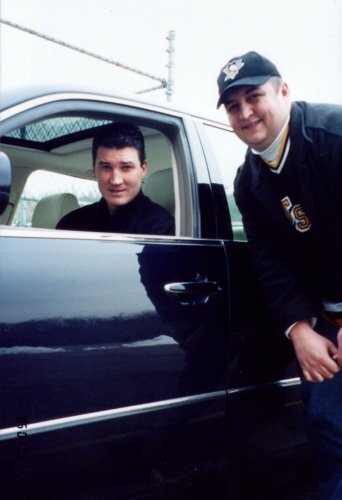 While he carried on signing Helen took a couple of shots of Mario with me in the background and even though I had asked him for a photo it looked like I was out of luck as he got in his car and started to pull away. Up steps the wife who starts frantically waving her arms at the car shouting can we have a photo, we’ve come all the way from England. To his credit, he stopped the car and posed for the pictures you see above and below - Helen managed to take two she was so nervous about making sure she got one!!!! Thinking back - the things that stick in my mind about meeting him is his size, this guy was HUGE, and the pounding in my chest as I realised I was stood next to my sporting hero and that it was a once in a lifetime experience - Thanks Mario! !